According to a recent study by Transparency Market Research (TMR), the global insecticides market is partially consolidated with top five companies accounting for more than 45% of the shares in 2014. These five leading companies in the global market for insecticides are FMC Corporation, Syngenta AG, BASF SE, The Dow Chemical Company, and Bayer AG. Companies operating in this market are heavily dependent on research and development activities, as registration and launch of any insecticide requires approval from legislation. More of these companies carry out R&D activities in-house as well as in government and private institutes. Product testing also plays an important role before the commercialization of insecticides. The TMR report evaluates that the global insecticides market had an opportunity worth US$2.6 bn in 2015, and estimates it to reach a valuation of US$3.9 bn by the end of 2023, rising at a healthy CAGR of 5.1% during the forecast period of 2015 to 2023. 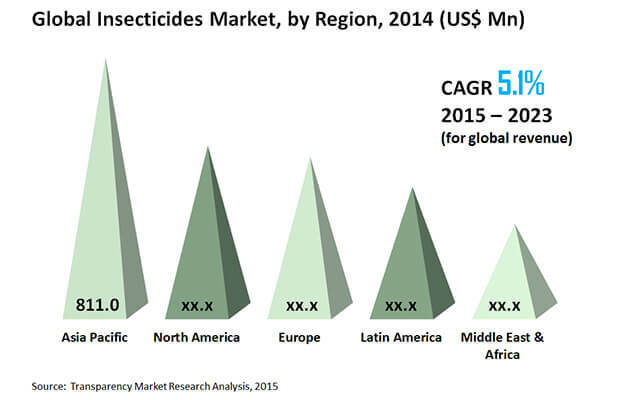 In terms of volume, the global insecticides market is projected to reach 788.12 kilo tons by 2023. Based on product, the TMR report segments the global insecticides market into organophosphates, organochlorines, pyrethrins and pyrethroids, carbamates, and others including benzoylureas, organosulfur, botanicals, and neonicotinoids. Out of these, organophosphates insecticides are most in demand, widely used as pest control crops as contact, systemic, and fumigant insecticides. However, this is becoming a less popular choice among farmers due to acute toxicity to vertebrate animals. Organophosphates accounted for a volume of 15.22 kilo tons in 2014, and the report estimates it to reach 20.35 kilo tons by 2023. On the basis of crop, the market for insecticides has been bifurcated into fruits and vegetables, cereals and grains, oilseeds and pulses, and others such as industrial and municipal, ornamental plants, household, and grass. Currently, the segment of cereals and grains is most lucrative, gaining from growing food demand across the world. Geographically, the report rates Asia Pacific as the most lucrative region in comparison to other regions analyzed, which are North America, Latin America, the Middle East and Africa, and Europe. In 2014, Asia Pacific contributed 37.10% of the demand for insecticides and is expected remain most profitable region throughout the forecast period. The rising need for better crop yield and increasing threat of pest infestation are the two most prominent factors driving the demand in the global insecticides market. Owing to escalating population, the need for better crop is constantly rising. Moreover, inadequate arable land has put pressure on farmers to increase their yield. According to the World Bank, farmers may have to increase their yield by 60% per hectare by 2050 in order to meet the escalating food demand, which can be met by the efficient use of current arable lands and increased yield growth rate through best crop management practices. Since climate change substantially affects the yield, the demand in the insecticides market is constantly rising, which are used to protect crops against chewing insects. On the other hand, adoption of advanced crop protection practices such as integrated pest management (IPM), organic farming, development of genetically modified (GM) crops, and crop rotation are expected to hinder the growth rate during the forecast period. According to the author of the report, “rise in adoption of biopesticides is opening new opportunities for the players in the global insecticides market. Biopesticides offer several advantages such as reduced toxicity in comparison to conventional pesticides, targeted control, and effectiveness.” Since biopesticides can lower the usage of conventional pesticides, the crop yield remains high and hence is gaining adoption.